First time participants, repeat paddlers, and serious competitors can all enjoy the excitement, challenge, and camaraderie that this historic event provides. With a choice of 22 different class specifications and course distances, there is something for everyone. We welcome all ages, levels of experience, and most boat and board types. Relax! Read through the class list. It's self explanatory. If you register for the 18.5 mile Marathon and prefer to not participate in the "racing" aspect of the event, select Class 22, No Contest. All 5.25 mile Minithon paddlers will participate as Class 1, No Contest. Awards are presented to 1st, 2nd and 3rd place finishers in all classes at a Finish Line ceremony at 3:00 p.m., except No Contest and Minithon participants. First place finishers in racing classes with six or more competing craft will receive the historic Voyageur figure trophy. First place finishers in racing classes with fewer than six competing craft will receive medallions, as will all second and third place racing class finishers. Important notes regarding paddlers under 16 years old: see Safety Rules#s 10 & 11. 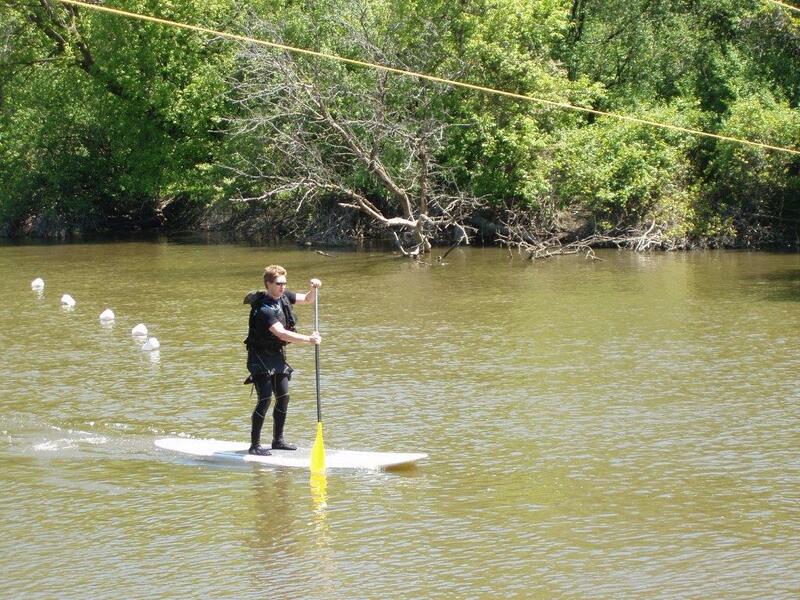 Minithon - A non-competitve paddle from Potawatomi Woods to finish line at Dam No. 2 Woods - a 5.25 mile alternative to the 18.5 mile Marathon, with the same scenery, excitement of paddling in an historic event and support for participants. • Any riverworthy paddle powered craft. registered and must sign a waiver form. Note: lead paddler of any craft with more than four occupants must contact info@canoemarathon.com to arrange for registration. Craft: aluminum or touring canoe. designed for racing. Excluded "racing canoes" include any non-aluminum racing canoe recognized by USCA, and any ICF canoe design. Ages: both paddlers must be 17 or younger on the day of the event. Craft: aluminum or touring canoe. Same specification as C2 Junior Men, Women or Mixed, see above. Ages: youth 14 or younger on day of event with an adult 29 or over on day of event. Craft: aluminum or touring canoe. Same specifications as C2 Junior Men, Women or Mixed, see above. Craft: any aluminum canoe except "super-aluminum" racing canoes such as Minnichs and Beavers, which must compete in the C2 Men Competition. Craft: touring canoe, any canoe not clearly designed for racing. Excluded "racing canoes" include any non-aluminum racing canoes recognized by USCA, and any IFC canoe designs. Craft: any double paddler, non-aluminum racing canoe recognized by USCA. Craft: any aluminum canoe except "super aluminum" racing canoes such as Minnichs and Beavers, which must compete in the C2 Women, Mixed Competition or the C2 Masters Competition class. Craft: touring canoe, any touring canoe not clearly designed for racing. Excluded "racing canoes" include any non-aluminum racing canoes recognized by USCA, and any ICF canoe design. Touring, any canoe not clearly designed for racing. Excluded "racing canoes" included any non-aluminum racing canoe recognized by USCA, and any IFC canoe design. Craft: any single paddler racing canoe recognized by USCA. K1 Unlimited Class or Open Racing class. Craft: same as K1 Man Recreational Kayak, see above. Craft: any kayak up to 18 feet in length, not including rudder (if any). Excluded, any kayak clearly designed for racing. For example, ICF kayaks, ICF trainers, surfskis and USCA specified downriver kayaks; such "racing' kayaks must compete in the K1 Unlimited class or Open Racing class. Craft: same as K1 Man Sea Kayak, see above. Craft: stand up paddleboard of any length Must be paddled entire length of course in a standing position. Any riverworthy, paddle-powered craft with four or fewer paddlers. Up to two awards will be presented per craft finishing first, second or third. Note: the lead paddler of any craft with more than two occupants must contact info@canoemarathon.com to arrange for registration. Any riverworthy paddle powered craft. All paddlers and passengers must be registered and must have signed the waiver form. Paddlers: up to two paddlers. Two-paddler teams may have up to two passengers.